Here's a practical guide for deciding which Android-friendly smartwatch platform is right for you. If your phone runs Android, and you’re interested in buying a smartwatch, your journey begins with answering a single fundamental question: Samsung Gear or Android Wear? Sure, there are other smartwatch platforms that work with Android phones, but Gear (perhaps best represented by the Gear S3) and Android Wear (represented by watches too numerous to mention) have the most mature ecosystems and refined hardware. Google's Android Wear platform has strong third-party app support, and if you opt for a Wear watch, you can choose from a wide variety of models in all shapes, sizes and styles. 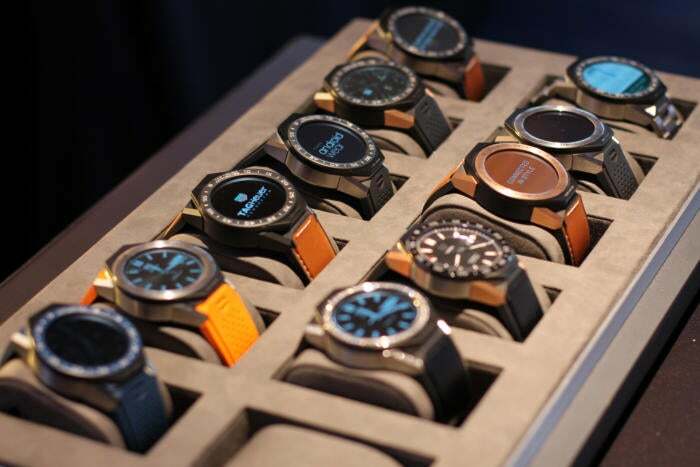 Samsung, meanwhile, has gone its own way with its Gear smartwatch line-up. These watches run Samsung software, and adhere strictly to the Samsung ecosystem, but also offer some benefits that Wear watches do not. Smartwatches can be almost as complex and varied as smartphones, so you'll want to consider the following criteria before you decide which platform is the right one for you. A quick glance at a regular watch tells you the time, but a smartwatch can tell you everything that's going on in your digital world with notification sync. Both Samsung Gear and Android Wear can show notifications from your phone, but the way they do it is very different. 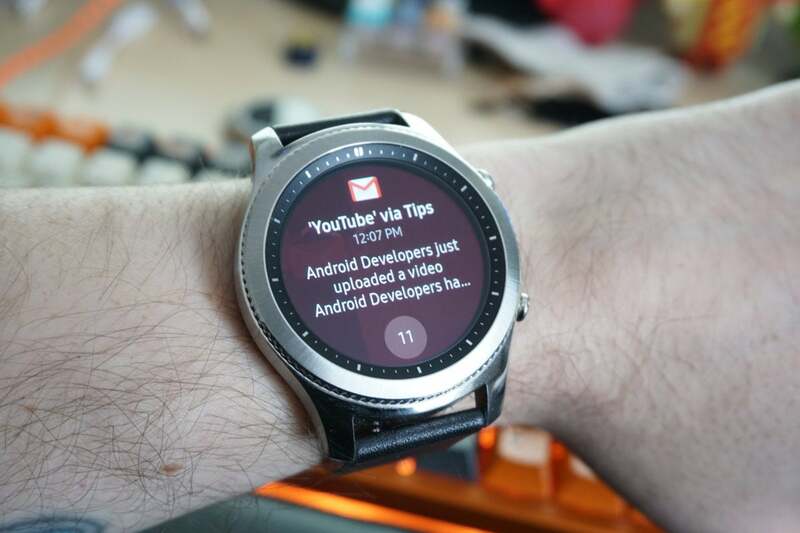 Android Wear's interface is based almost entirely on notifications. You swipe up and down to page through them, and you get everything, including emails, image messages, and media playback notifications. Android Wear, however, also unbundles all the bundled notifications from your phone. The upshot is each email notification you get on the Wear watch has its own separate page, and that can be tedious to navigate if you get a lot of email. Samsung's Gear software keeps notifications in bundles for easier management. It’s also worth noting that the rotating crown for scrolling through notification lists is only available on a few Wear watches—notably the LG Watch Sport. This means you better get used to swiping. Samsung Gear keeps notifications bundled and places them to the left of the watch face. On most Samsung watches, you can flip through them with a swipe or with Samsung’s rotating bezel. Each notification stack can be expanded, and the rotating bezel quickly scrolls through them. Media notifications aren't shown natively on Gear watches, but you do have a playback widget that can be placed off to the right of the watch face (widget location for all apps is customizable). This approach is more convenient than, say, searching through a stack of Android Wear email notifications to find a play button. Both platforms support two-way sync. This allows you to deal with notifications on your watch, and not see them again the next time you pick up the phone. Neither notification engine is inherently better, but Samsung's approach makes dealing with large volumes of email easier. As you might expect, Samsung's watches run Samsung Health while Android Wear is tied into Google Fit. However, Android Wear device makers can also include their own extra fitness apps. So, for example, if you're already using a Huawei fitness app on your Huawei phone, a Huawei smartwatch might make sense. Google Fit is good for step counting and heart rate tracking, but its exercise features are rudimentary, and Google has yet to crack the code on automatic tracking for workouts. Also, some Android Wear devices—even very expensive ones—don't have heart rate sensors at all. Gear has extremely reliable automatic workout tracking. Fitness tracking is one of the Gear watches’ killer features. They track steps and sample your heart rate, and Samsung’s exercise tracking is borderline magical. 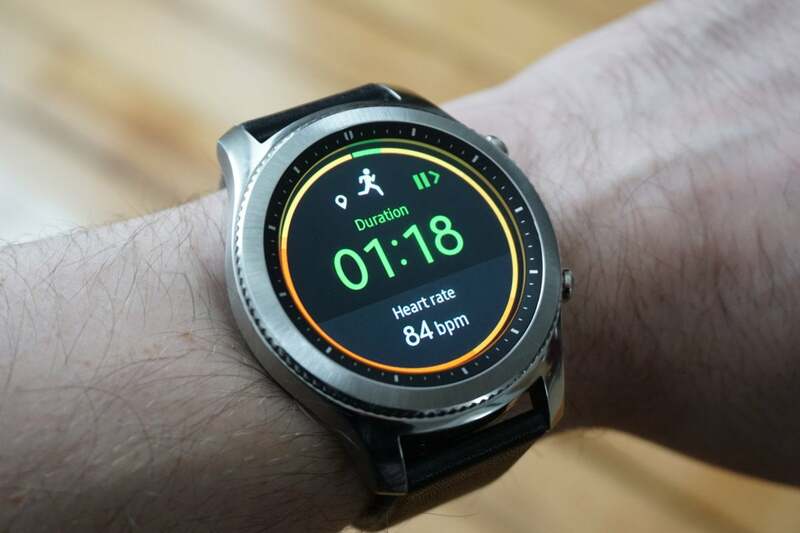 Within a few seconds of starting an exercise, watches like the Gear S3 and Gear Sport can figure out what you're doing—whether that be running, walking, elliptical, cycling or more—and begin logging the activity. No additional setup is needed and all your data is saved to Samsung Health. The Gear Sport can also do more advanced things like swim tracking. This one is a blowout. Samsung Gear devices are worlds better than Android Wear at fitness tracking. None of the third-party fitness apps on Android Wear can match the power of Samsung's built-in features. Google wisely tied Android Wear apps into the Play Store ecosystem by encouraging developers to add Android Wear support to existing apps. In Wear 2.0 and later, you can even browse the Play Store on your watch. The app ecosystem isn't as deep as it is for phones, but many of the top developers have added support. There are apps from Nest, IFTTT, Play Music , Facebook Messenger, and more. Over in Samsung land, poor app selection is one of the biggest drawbacks for Gear watches. The pre-installed apps are the best ones on the platform because developers haven’t gotten serious about supporting Samsung's Tizen software on any device, neither phones nor watches. The only apps worth downloading are the handful that were developed in partnership with Samsung, like Flipboard and Spotify. Android Wear has many thousands of apps via the Play store, but Gear only has a handful. All that said, navigating your app list on Samsung Gear is really cool: You can use the rotating bezel to highlight apps, and then tap in the middle to launch. This is much easier than tapping the tiny icons on Android Wear. But this doesn't save Samsung in this category. 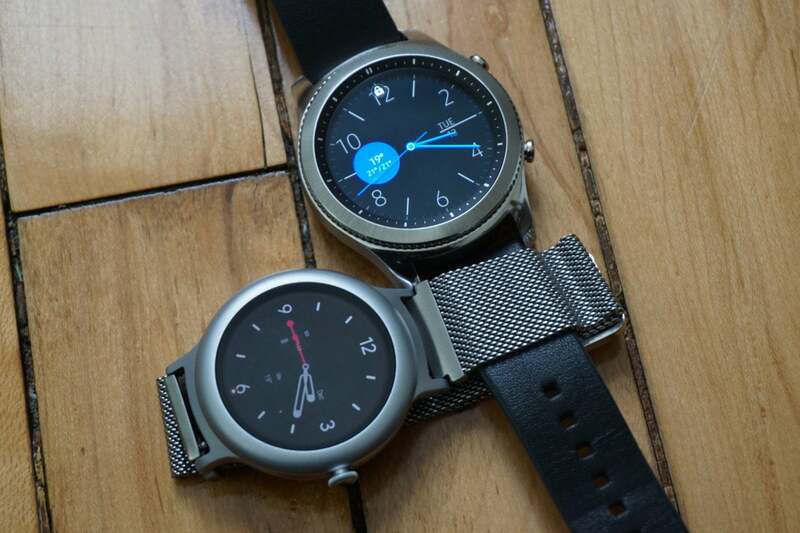 App support is a clear win for Android Wear. Phones have generally become easier to use as their screens have gotten bigger, but watches can’t play that game—they need to fit on our wrists, after all. 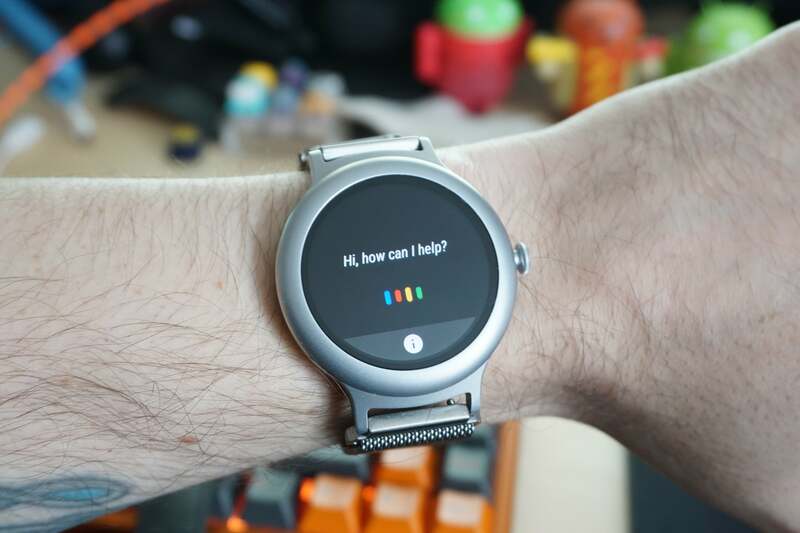 Luckily, voice interaction gives us an alternative to touch control for replying to messages and getting things done, and it’s a cornerstone of the Android Wear experience thanks to fantastic integration with Google Assistant. Android Wear’s voice input is often surprisingly accurate, and a long-press of the crown button launches Google Assistant from any screen. Assistant on a Wear watch offers most of the same capabilities as Assistant on your phone or a Google Home smart speaker—you can perform searches, set reminders, and control smart home devices, among other tricks. Google Assistant blows S Voice out of the water. Samsung is in a transitional period with voice control on its phones. It now has its own Bixby digital assistant, but Bixby doesn’t offer very strong support for apps and services. What’s more, there’s no Bixby on Gear watches yet, so the voice control platform remains S Voice, and it's definitely showing its age. 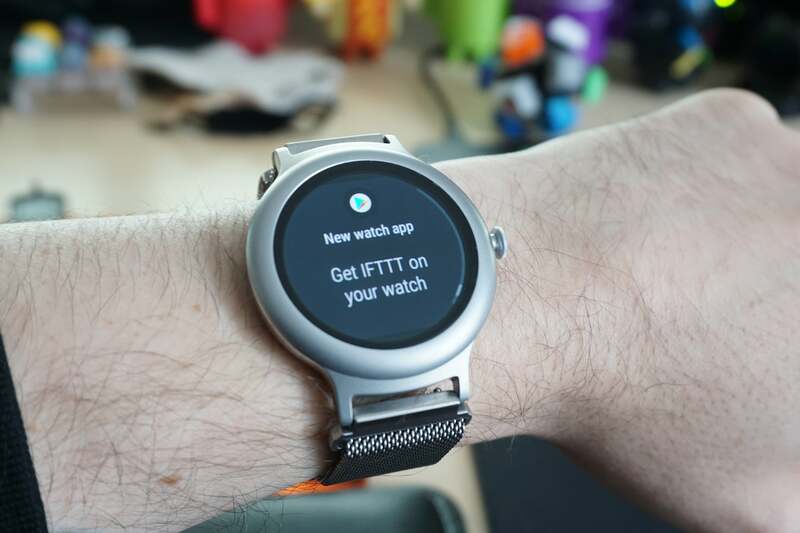 It's serviceable for inputting text or creating a reminder, but Google Assistant on Android Wear is more accurate. What’s more, S Voice is terrible when it comes to search queries, and there's no smart home integration. Google Assistant is a much better experience, so that's a big win for Android Wear. The story here is very similar to the one for apps. Android Wear has many more options thanks to higher developer adoption. Wear watch faces are distributed through the Play Store, sometimes along with apps. These watch faces can also display data pulled from other apps, giving you “complications” like you’d find on a fancy analog watch. When it comes to watch faces, Android Wear has much more variety and customization. 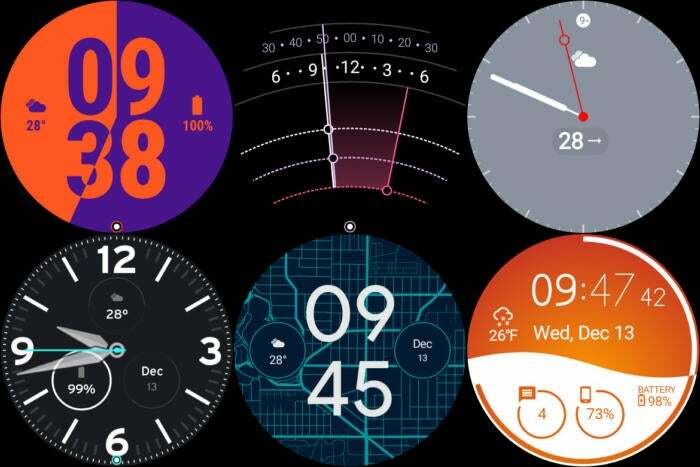 On Samsung Gear, watch face selection is much weaker. It's better than the app situation, but few of the Gear faces are as customizable or powerful as what you find on Wear. The one bright spot: Custom watch face design apps like Facer and Watchmaker work on both platforms. Using your watch as a phone for voice calls is handled in a similar fashion on both platforms, but the capabilities vary based on the specific watch you have. Calls that come in to your connected phone show up as notifications on both Android Wear and Samsung Gear. Most Android Wear devices have speakers and microphones so you can actually take the call without touching your phone. Some Wear watches even have LTE connections so you can take calls without your phone present. And, of course, you can dismiss a phone call entirely from your watch. That’s table stakes. 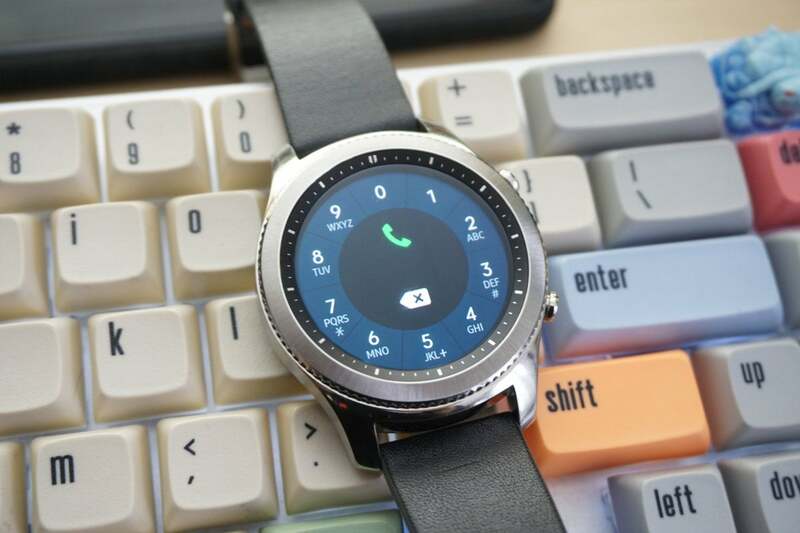 Both watch platforms support phone calls well enough, but the Gear watches have an easier-to-use dialer..
Gear devices can also answer calls from your phone, but support varies across the model range. The newer Gear Sport, for one, lacks a speaker, so you can answer and place calls from that watch, but you need a connected phone or Bluetooth headset in order to actually hear anything. 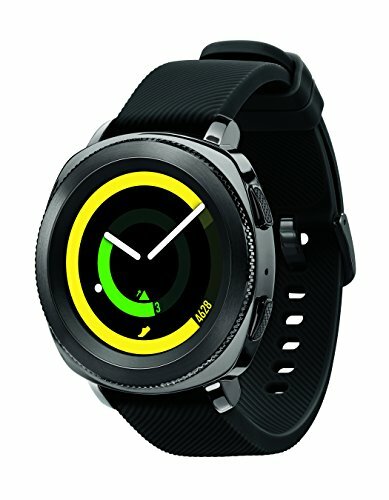 Also, there's only one LTE watch on the Gear side right now, the Gear S3 Frontier. Samsung's watches do have a more robust dialer, though. The Android Wear dial pad is cramped, making it annoying to place calls to numbers you don't have saved. There are currently several dozen smartwatches running Android Wear, giving the platform healthy variety in terms of sizes and styles. There are cheaper options that cost around $150 (like the TicWatch 2) and obnoxiously expensive watches, like the $1,500 Tag Heuer Connected Modular 45. You also have smaller, simple watches like the LG Watch Style and more robust watches like the Asus ZenWatch 3. The TAG Heuer Connected Modular 45 is not only the pinnacle of smartwatch design. It also comes in a wide variety of styles. Samsung's Gear line only comes in a handful of flavors, all of which are on the expensive side. There's the Gear S3, the slightly smaller Gear Sport, and the fitness tracker-influenced Gear Fit2/Fit2 Pro. There are also some older Gear S2 devices still floating around. They all have similar styles and feature sets. Bottom line: If you want variety, Android Wear has it. 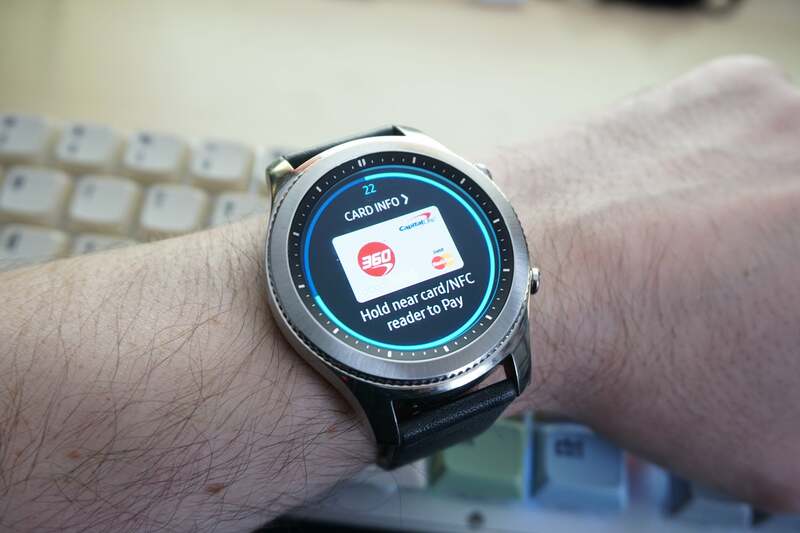 Some Android Wear devices support Google's mobile payment platform, Android Pay. But support is still far from a sure thing, as many watches still ship without the required NFC hardware. 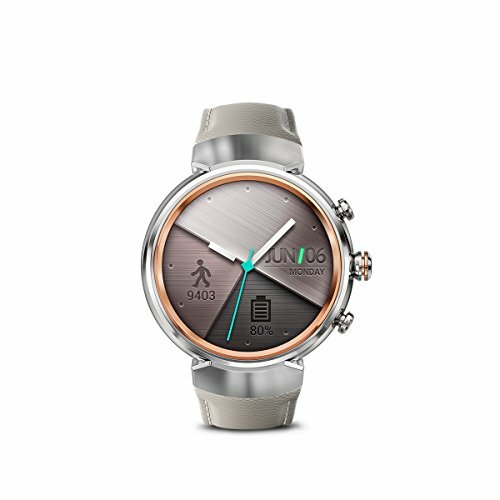 Watches like the Huawei Watch 2 do have NFC, allowing you to make payments from the watch at stores that accept Android Pay. But, unfortunately, that's still far from all stores. 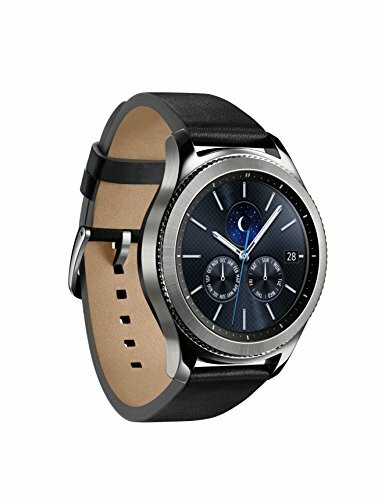 On the Samsung Gear devices, you have Samsung Pay, and that can be much more useful if you get the Gear S3. That watch has the full Samsung Pay experience, meaning it can do both NFC (like Android pay) and Magnetic Secure Transmission (MST). With MST, you can make payments at almost any store that has a credit card reader. However, MST hardware isn't available in the Gear Sport, and the Gear Fit2 Pro doesn't have NFC or MST. The Gear S3 can make payments in almost any store. So, mobile payments are much better on Samsung, as long as you get the Gear S3. Otherwise, it's a draw. If you're torn on which way to go, start by checking out the style of Samsung's Gear devices. There are only a few, so if they don't appeal to you, Android Wear's larger watch ecosystem will probably be more to your liking. Android Wear is also strong when it comes to apps and watch faces, and the Google Assistant integration is excellent. Samsung Gear excels in fitness tracking—it's uncanny how quickly and accurately it can detect workouts. Samsung's Gear software is also better for managing large numbers of notifications, and the interface is easy to navigate with the rotating bezel. Android Wear's rotating crown is nice, but is only available on a few devices.